We offer Spa Inspired Pedicures & Manicures. We offer Artificial & Natural Nails Care. 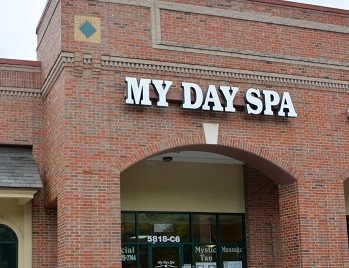 If you are looking for a Full Service Spa in the neighborhood, you have come to the right place. My Day Spa specialize in Nail Care, Waxing, Threading, Facials, Massage, Reflexology. Ask about our SPA PACKAGES and GIFT CERTIFICATES! Make an appointment or walk right in, we are here to pamper you at your convenience. Locally owned and family operated for more than 17 years. We guarantee that you will feel relax in our beautiful redesigned salon and will love your new nails. If you have any questions please don't hesitate to contact us via EMAIL, PHONE or stop by the store. Thank you for visiting our website, have a beautiful day!